It is quite common to get Node is Empty warning in WordPress when tested in Structured Data Testing Tool. There should be a property inside. Previously, we have discussed about how to Fix WordPress mainContentOfPage Schema Error in Genesis. Despite WordPress is a Free Software, these Themes are not Free Softwares. Due to the closed source model of software distribution, it is very difficult for the community to participate and fix them. These Themes gradually proving one basic thing – Google demands highly specialized persons in Theme development and the current developers has too much superficial knowledge. Mix and Match, Trial and Error methods used to add micro data; which now are failing. We have fixed the major error ourselves but we can not distribute it as it is a closed source software. 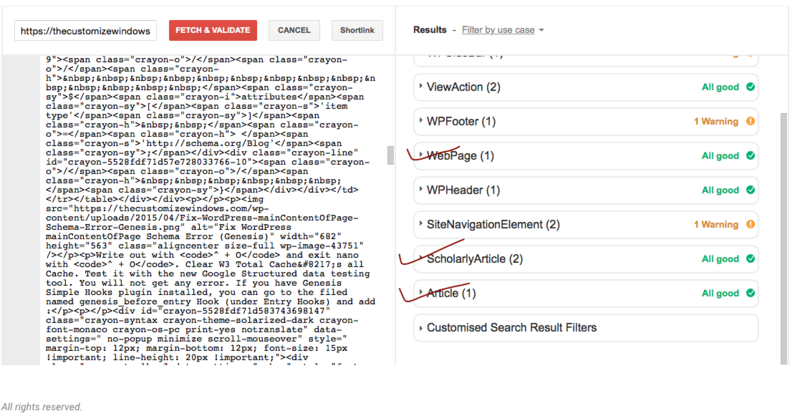 Node is Empty Warning in WordPress in Google Structured Data Testing is not exactly harmful but it does indicate a kind of automated common method used while crafting the webpage. Which can lower down the SERP in near future. These are not only problem of Genesis, these are problems of most of the paid Themes. Red marked Errors must be fixed to avoid penalty. These errors can decrease the number of site links and other variables on SERP. The developers lack the idea about HTML5 Vocabulary and Interfaces, so about the hierarchy of the represented data. Adding the Item Type Text and Item Prop text. Text and text are not same. After you add these inside a Widget, WPSideBar itself will not itself show as Node is Empty. It will give error against the Text Item. All fields on the Widgets have to filled up properly, our knows Item is within Widget, adding one Item will not work. These are arising due to the Theme developers desperate trials to over optimize. This Article Has Been Shared 839 Times! Cite this article as: Abhishek Ghosh, "Node is Empty Warning in WordPress Structured Data Testing," in The Customize Windows, April 11, 2015, April 25, 2019, https://thecustomizewindows.com/2015/04/node-is-empty-warning-in-wordpress-structured-data-testing/.